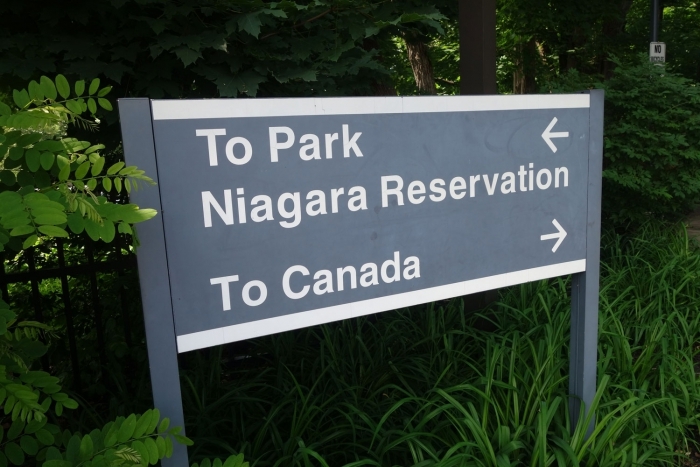 When first planning our rough travel across the U.S., we had thought of travelling from Boston up to Montreal, across the Toronto and then down into Niagara Falls. Turns out that we wanted more time in other places along the way and so eventually cut Montreal and Toronto from our plans to be visited at another time. We just couldn't pass up a trip to Niagara Falls though and so decided to make the 7 hour journey from Boston. 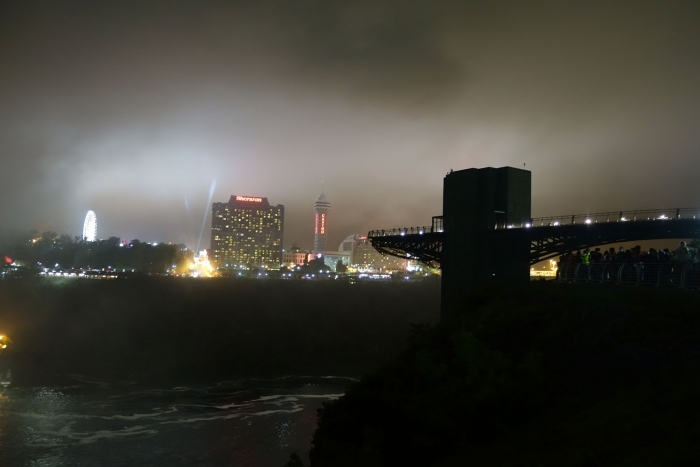 We arrived in Niagara, NY on Sunday evening and were quite excited to learn that there are fireworks on Friday and Sunday nights over the falls. Our hotel was quite close to the American Falls and so we walked down at around 9.50pm to see them. The walk took a little longer than expected and so bang on 10pm as we were nearing the falls we heard the fireworks start. Unsure of how long they last we sprinted the last bit and joined the throngs of people at the American Falls viewpoint. Sadly there was so much mist around that you couldn't actually see the fireworks at all, only hear them! The finale sounded spectacular and I'm guessing must look awesome on a clear night but we do not know for certain what on earth they are like. The next day we started off by heading to the Maid in the Mist tour; something I was very excited about. 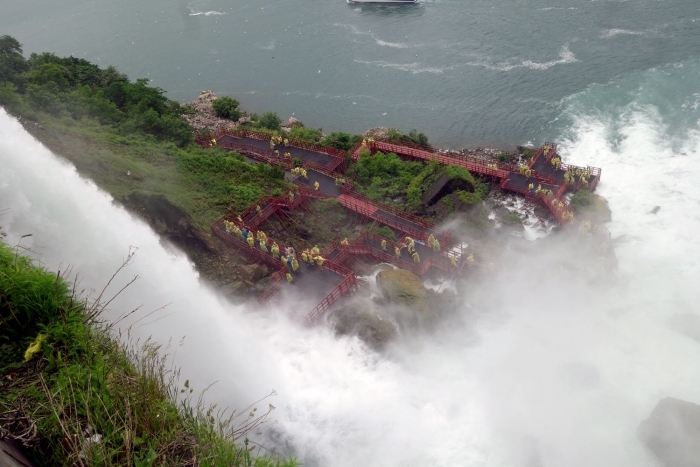 It costs $17 per person and gives you access to the observation tower, the boat ride and a short walkway up close to the American Falls. We headed for the boat first, got our ponchos on and set sail. It was still quite foggy that morning and so was a little difficult to see when we got close to Horseshoe Falls but the experience was amazing. 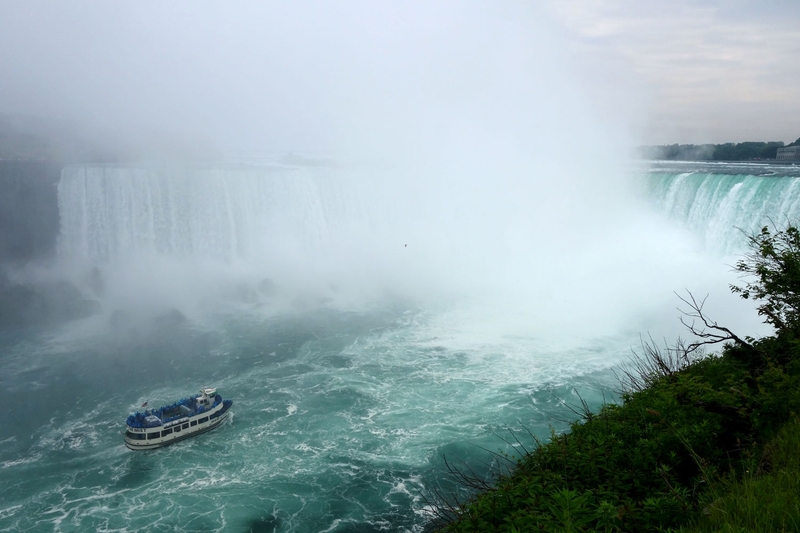 They take you right into the mist of Horseshoe falls and it feels as though you are in a storm or something. You get absolutely soaked, it's almost hard to stand upright the force of the water that is being chucked at you! I would definitely recommend do it again. We got off the boat and walked up to the American Falls - it's a nice viewpoint to see them from below and you get a little wet here again but it is nothing like Cave of Winds which we experienced next. To get to Cave of Winds in Goat Island we walked past a viewpoint of the Horseshoe falls (which was starting to clear a bit) - it's a better viewpoint than the one directly over the American Falls and so worth the 15 minute walk! 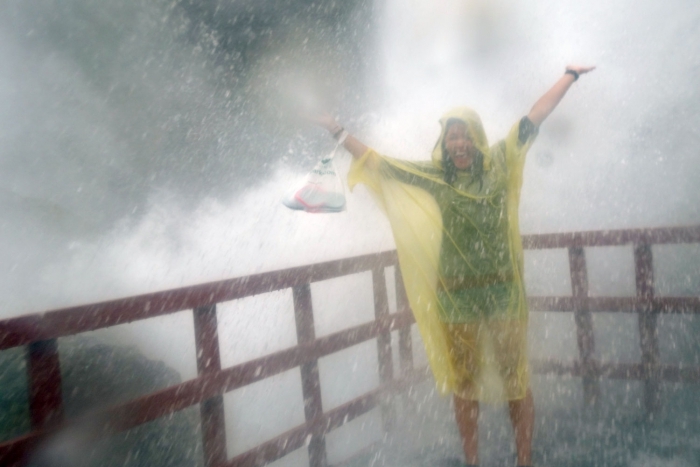 We wanted to get up close to the falls, not just the boat tour and so had to decide between Cave of Winds on the American Side or Journey Behind the Falls on the Canadian side. After reading loads of reviews online the consensus seemed to be that Cave of Winds was better and so we went for that one. It costs $14 each and you get a poncho and some stylish special sandals. You get ridiculously wet on this walk - the ponchos didn't even really cut it, we were drenched right through. You walk up a wooden boardwalk that is underneath Bridal veil falls (part of the American side) and I understood why they give you sandals when you see the water pouring in and over the walkways completely flooding them. At the climax of the walk you can stand directly under the thundering falls (it's actually pretty hard to avoid it when you get to the top); this was the best bit. I couldn't see anything, there was so much water and the force of the falls are incredible! I honestly don't know which I enjoyed more, Maid of the Mist or this; I would heartily recommend either. In the afternoon we crossed the Rainbow bridge to get a closer look at Horseshoe Falls and to grab some Canadian treats that we loved from our first month in North America. There is a pedestrian walkway across the bridge and you have to go through border control so must have your passport and any visas you may require. The passed through the Canadian side with no bother and walked across the bridge (where there are some pretty awesome views of both the American and Horseshoe Falls). 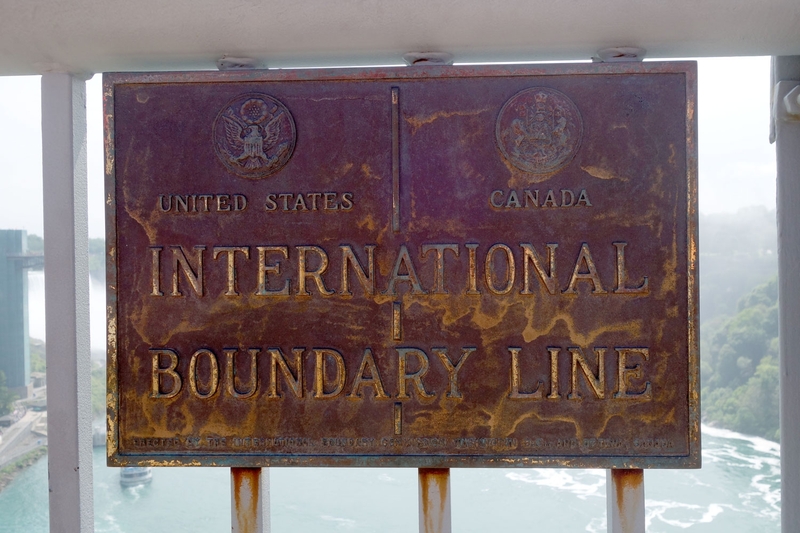 We also thoroughly enjoyed the novelty of 'standing in two places at once'; USA and Canada in the middle of the bridge. There was still a lot of mist hanging around Horseshoe Falls but it definitely cleared as the day went on. 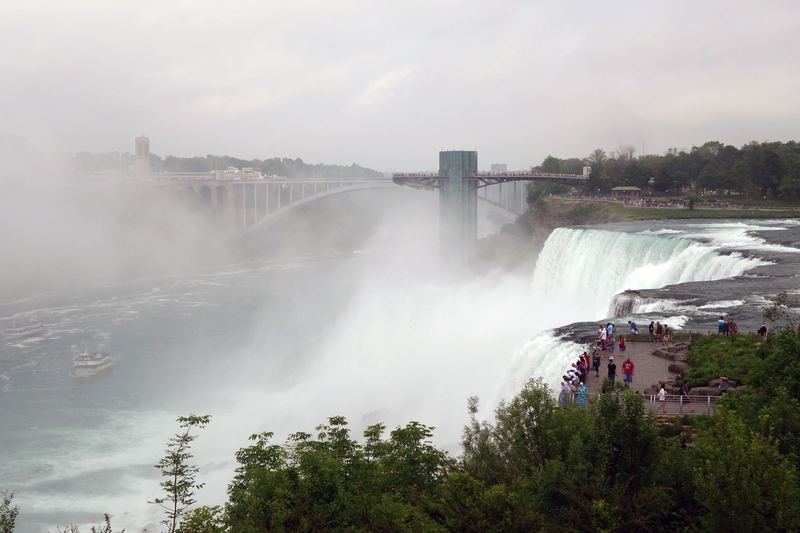 We walked down the Canadian side and got some pretty good shots of the American Falls as well as journeying right up to Horseshoe falls so we could get a better glimpse of it behind the fog. 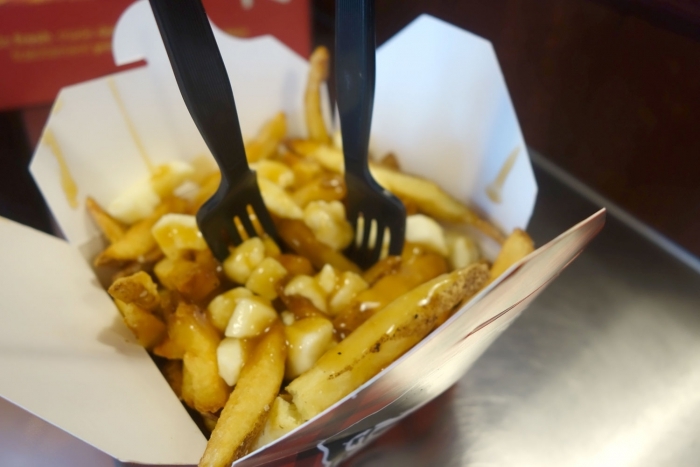 If I'm honest, the Canadian side know how to do it right. Their views are better and the town there is well developed. 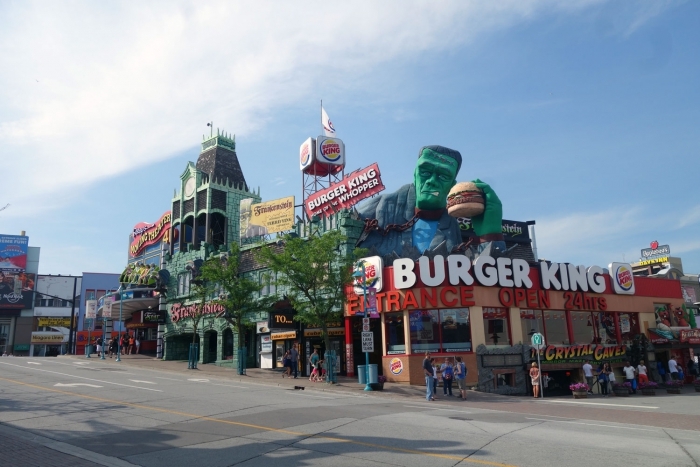 The American side seems a bit rundown and depressing beside its Canadian counterpart. We ended the day with a visit to Tim Hortons (super cheap donuts and yummy French vanilla instant cappuccino that we bought again for home having enjoyed it immensely on the west coast) and grabbing some Poutine in a poutinerie called "Smoke's", essentially trying to experience as much Canada as we could in the few hours that we had. Then it was back over Rainbow Bridge again (where there is a toll of 50c in this direction!) and through USA border control which is a lot more beefed up than the Canadian side is. Then it was time to leave Niagara and start to head back to Boston - it was one of the funnest days that we had had in ages so I would definitely advocate trying to make it there if you see visiting anywhere in the vicinity!